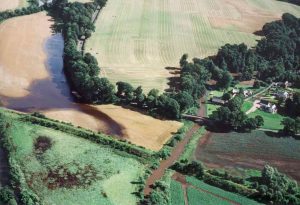 On Tuesday 29th November 2016 David Woolliscroft has been invited to give a talk on “How far north did the Gask System extend (and when)?” as part of the University of Durham’s Birley Lectures which are organised together with Hatfield College. 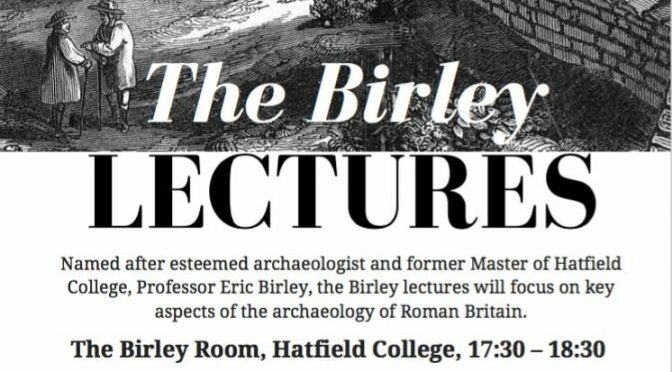 “We’ve just launched the programme for the Birley Lectures on Roman Britain, taking place throughout Michaelmas Term at Hatfield College. 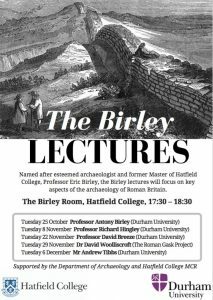 The first lecture is being given by Prof Antony Birley on ‘The Young Eric Birley’, former Master of the College and Head of Archaeology at Durham. Other speakers include David Breeze, David Woolliscroft, and Richard Hingley. The Lectures will take place in the Birley Room in Hatfield College, Durham.